As we draw near to our 2018 DI Annual Meeting, we wanted to give you a heads-up on all of the exciting, proactive discussions planned. Our diverse, 68 member democracy coalition will convene to appraise the current field for democracy reform and lay out the path forward in tactical, concrete measures for 20 reforms by 2020. An authentic, pragmatic conversation focused on mobilization infrastructures and cultural competency. Our panel of young diverse grassroots leaders from winning campaigns—such as Nse Ufot, Executive Director of the New Georgia Project, Joanne Antoine, Manager of State Outreach & Engagement from Common Cause, and Haley Arata, Field Organizer with Arab American Institute—will highlight gaps in the field, challenges of race and gender, and offer their insights into practices to strengthen and sustain large-scale, grassroots-led mobilization in the states. Our panel respondents from a winning campaign in Michigan, labor, civil rights, and diverse communities will offer their thoughts and insight into what these crucial insights mean for the field going forward. The best part is that there's more to come—these are only a few highlights. We have heard your feedback, and so we will have three small-group breakout sessions devoted to strategy. The breakouts will go deep into the opportunities to advance our democracy package at the state level. Participants will be asked to identify goals, map strategy, and identify concrete “next steps” for the first quarter of 2019. The three themes of the breakout sessions are: building a powerful legislative policy package; Corporate campaigns and the connection between democracy reform and bad actors in economic and water fights—with Nayyirah Sheriff from Flint Rising; and narrative and messaging around the DI and democracy reform. Missouri Labor Movement— the coalition of DI labor partners and allies’ overwhelming defeat of the "Right to Work" referendum in Missouri represented a huge victory for organized labor and a decisive repudiation by voters of the Supreme Court's ruling against the right to organize with the Janus decision. Kary Moss of the Michigan ACLU for Promote the Vote and Katey Fahey of Voters Not Politicians—Two pro-democracy ballot initiative campaigns in Michigan, "Promote the Vote" and "Voters Not Politicians," delivered a one-two punch for a 21st century democracy. Their success will have a transformative effect on the electoral system in Michigan. Maya Berry, Executive Director AAI—The Arab American Institute marked the 20th year of their voter engagement campaign, Y’alla Vote!, and continued its role as a leader in the election protection program, helping to mobilize and support thousands of voters on Election Day. Special guest Rev. 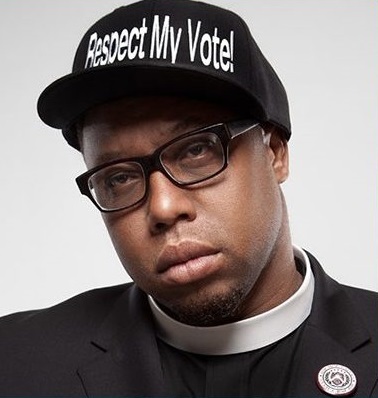 Lennox Yearwood Jr., President and CEO of the Hip Hop Caucus, is a minister, community activist and one of the most influential people in Hip Hop political life. Rev. Yearwood is a national leader in engaging young people in electoral activism. He leads the national Respect My Vote! Campaign and coalition. A national leader and pacemaker within the green movement, Rev. Yearwood has been successfully bridging the gap between communities of color and environmental issue advocacy over the past decade. 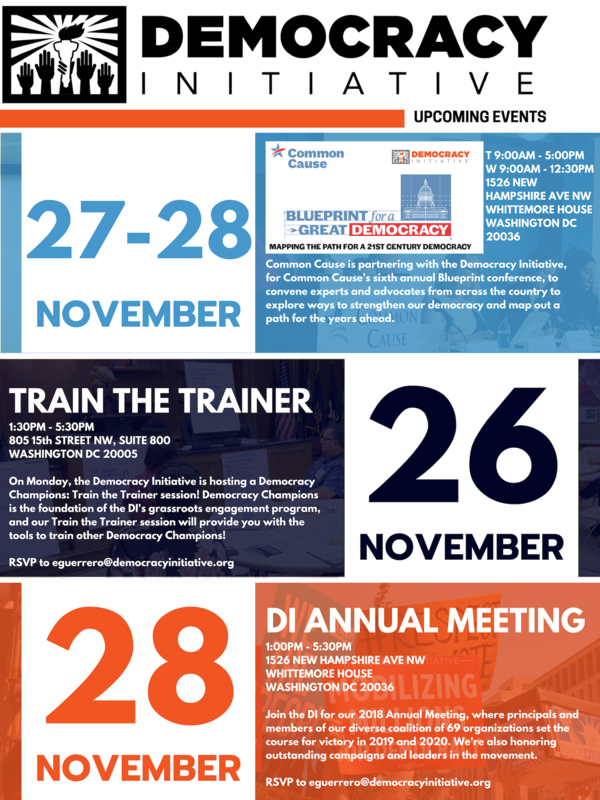 As we prepare for the Democracy Champions Trainings in 2019, we are excited to invite you to a Train the Trainer workshop on Monday, November 26. The goal is both simple and audacious: to create a grassroots force of Democracy Champions who will be inspired, motivated and empowered to take on democracy campaigns across the country in 2019 - 2020. We will deploy Democracy Champions Trainers to the field to help train members to strengthen democracy reform campaigns as we work to reach our goal of 20 reforms by 2020. And the first toward this goal is to train our 2019 class of trainers. We would like to invite you to join us! Space is filling fast, but we want you and your organization to be there! If you have organizers in the states you would like to recruit, a limited number of travel stipends and subsidized hotel rooms are available. Trainers are encouraged to stay for Common Cause’s Blueprint for a Great Democracy conference and the DI’s Annual Meeting. Trainers do not need to be subject-matter experts. They do need to be good listeners, enthusiastic, committed, skilled in 1:1 communication, and able to travel to trainings. Grassroots organizing experience is helpful. Since initial Democracy Champions trainings will be held in the states, trainers from outside of DC are especially welcome. If you have questions, feel free to follow up with Getachew Kassa at gkassa@democracyinitiative.org. The Democracy Initiative is still accepting responses to our 2018 Annual Meeting invitations!